During last year's "Crosses for Life," Bethany Butler hands her brother Brock a cross for placement. Their father was preparing crosses and handing them to Bethany. Is that Ben Hooten in the background? Two events will be held in the Spa city this weekend by those who believe that life is sacred from the time of conception. 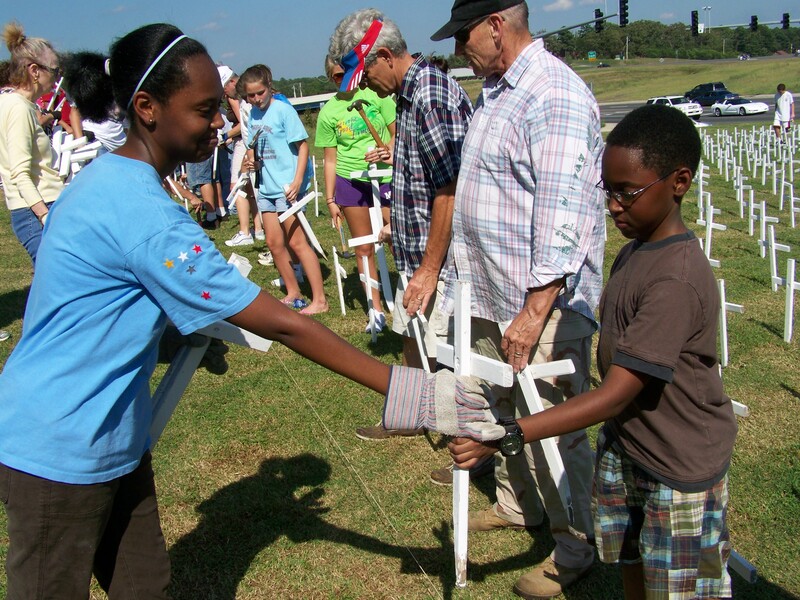 On Saturday, October 2nd, the “Crosses for Life” will be installed on the lawn at the First Church of the Nazarene at 3904 Central Avenue. The “Crosses for Life” are a silent witness to the children who die by abortion every day in our country. The work will begin at 1:00 p.m. If you would like to help, bring a large hammer or small sledge hammer, work gloves, water, and sun protection. Rain didn't stop the 2009 Life Chain. On Sunday, October 3rd, a “Life Chain” will be formed at the Hill Wheatly Plaza at Central and Reserve streets. Life Chain is a prayerful and peaceful public witness of pro-life people, standing for one hour, praying for our nation and an end to abortion. It is a visual statement of solidarity by those from all walks of life in our community. The event will begin at 1:30 and will end at 2:30. For those who would like to be a part of the event, you will stand with thousands of pro-lifers throughout the USA and Canada! 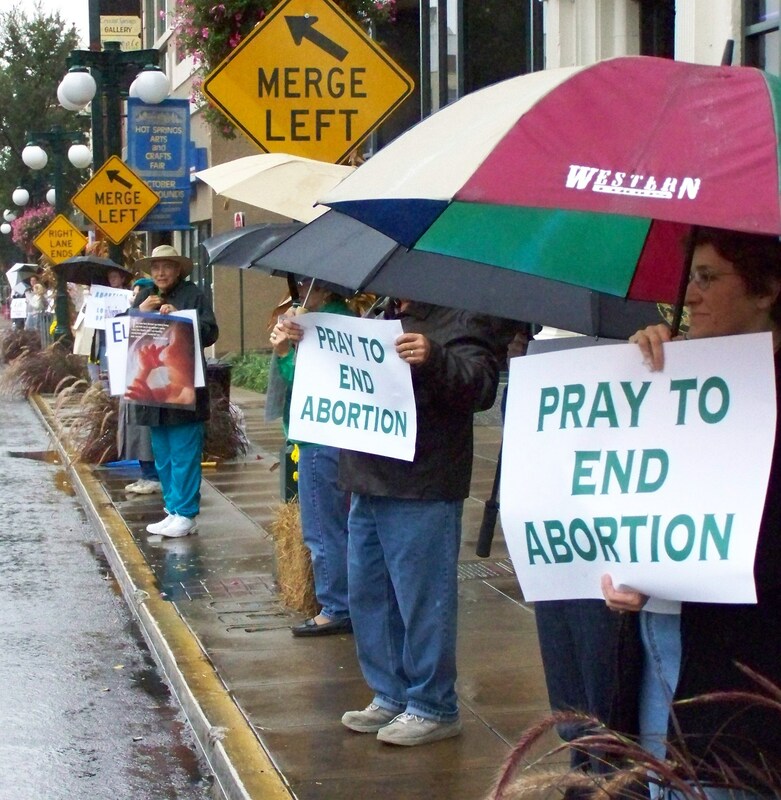 You will be a light in a darkened world as you help put an end to abortion through prayer! Water, lawn chairs, umbrellas and strollers are welcome! Signs will be provided in both English and Spanish. Identical signs are used in all Life Chains across the continent. Be courteous; do not block access to parking or to business entrances. Do not stand on National Park Property. For more information on either event, call Kelly at 501-463-1796 or email GarlandCountyRightToLife@gmail.com. 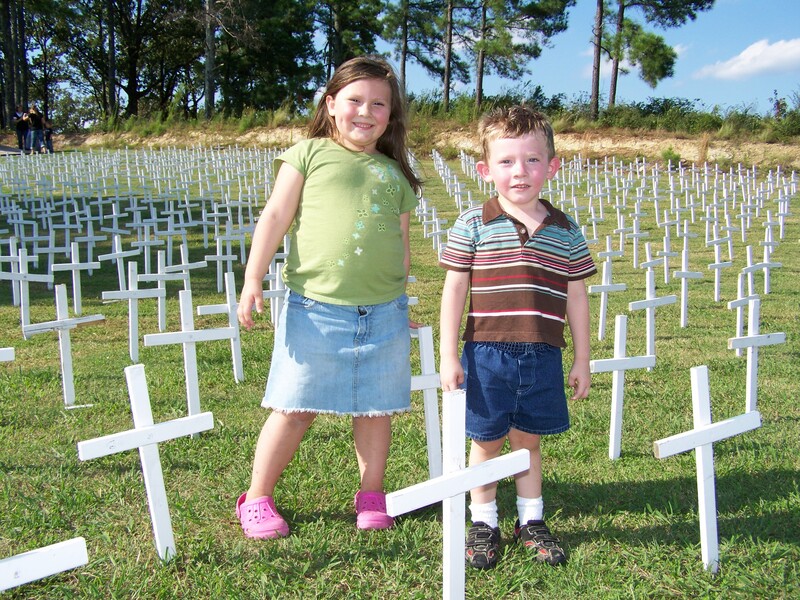 Zanlynn and Zander survey their fine work at the 2009 "Crosses for Life." Manny, creator of the blog “Kairos Now”, saw this article and added two posts dealing with the abortion issue. You may want to check them out. This entry was posted on Thursday, September 30th, 2010 at 11:04 PM and is filed under Abortion, Commentary, News. You can follow any responses to this entry through the RSS 2.0 feed. You can leave a response, or trackback from your own site. What a great event! I am adding my prayers to this event in your community and in the nation. It stirred up a remembrance of an article that touched the world, and myself. You’re welcome, Manny. Thank you for your prayers. I saw your site and I’m putting a link to it at the bottom of my post because of the related stories you have posted. After a look at your blog, it doesn’t surprise me that you are involved in this issue as I am. You recognize it for what it is: evil. If only our society as a whole had that view. I appreciate what you and your wife are doing.